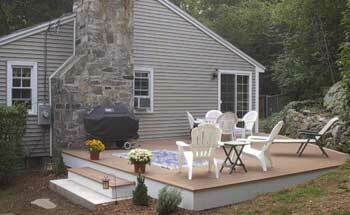 The idea of an outdoor kitchen can either be daunting or exciting depending on the homeowner. An outdoor kitchen is more than just a grill and patio furniture. This space affords the same creativity that an indoor kitchen renovation does. It also offers the comfort of nice appliances and luxurious masonry and woodwork as well as updated lighting designs, outdoor refrigerators, custom built islands for grilling and gas, wood or coal fireplaces and pits. If an outdoor kitchen is your desire, treat it with the same investment you would for your indoor kitchen. With the time spent outdoors, you want your outdoor living space to be the best it can be while taking advantage of many times limited space. With Wyeth Woodworking and Remodeling, we take advantage of your space and apply our creativity to make a functional outdoor kitchen for entertaining your family and friends or just relaxing in a perfect luxurious atmosphere. Outdoor kitchens are more than just a luxury for the griller in your family, they add value to your home. The design should be done and implemented professionally with the same care and craftsmanship as an indoor kitchen. This includes everything from selecting the right design concept (an island, a "L" shaped island, a "U" shaped island among the more popular choices) to selecting the best outdoor grill equipment for your outdoor kitchen. Our contractors will guide you through all of these choices to ensure we are creating the most functional kitchen for you. If you are unsure what appliances, stonework or grills fit into your space, give Wyeth Woodworking and Remodeling a call. Our licensed contractors have the valuable expertise and latest trends on tap to give your outdoor space the boost it needs to accommodate your cooking needs!